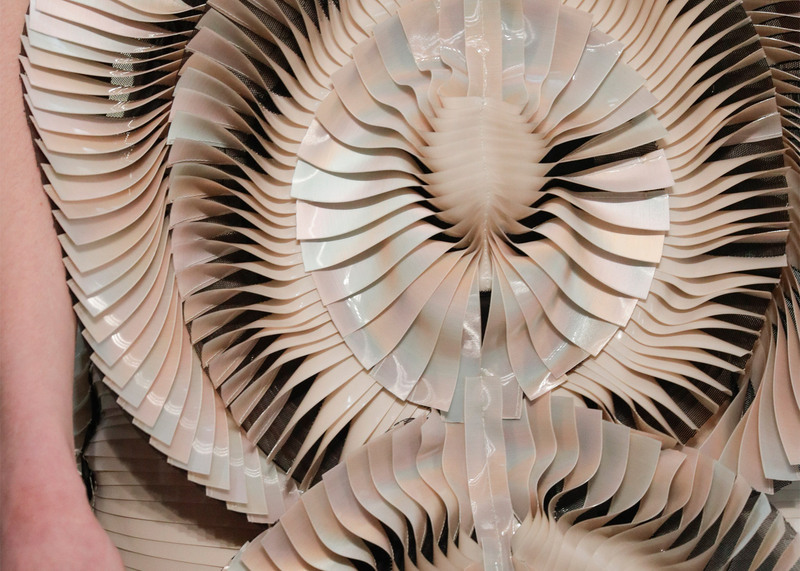 Dutch fashion designer Iris van Herpen has created a dress using thousands of hand-blown glass balls for her haute-couture collection, shown in Paris this week. The glass dress was a standout piece from Van Herpen's Seijaku collection, presented in L'Oratoire du Louvre church for Autumn Winter 2016. 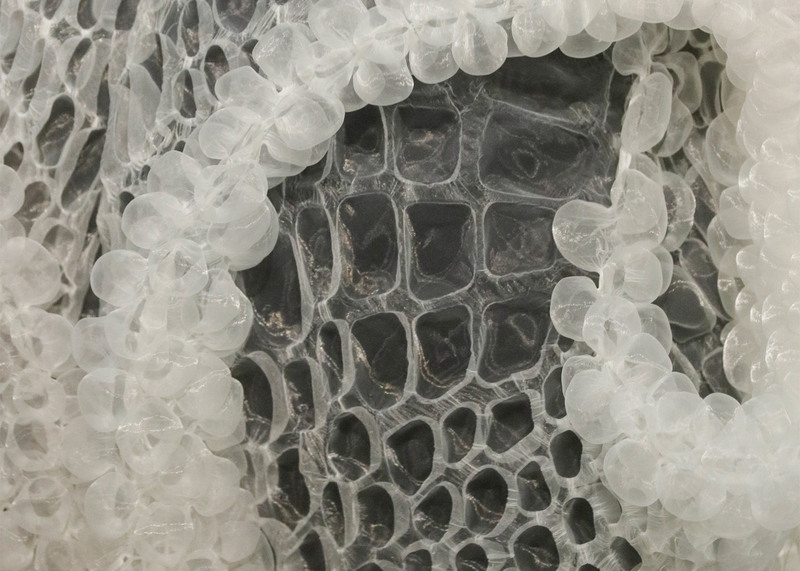 To create the garment, the designer coated thousands of glass balls with transparent silicone. The silicone enabled the bubbles to stick together in a solid structure, forming a "bioluminescent prism around the body". 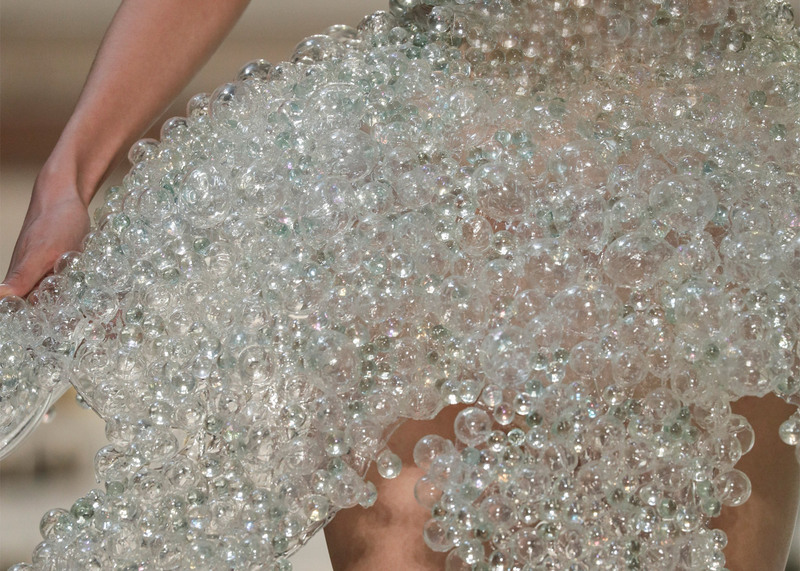 The bubble-like balls were arranged into a high-necked, sleeveless bodice and extended out from the waist into a skirt. Another dress was influenced by the work of Japanese artist Kohei Nawa, who creates animal forms out of glass bubbles and large-scale installations using foam. 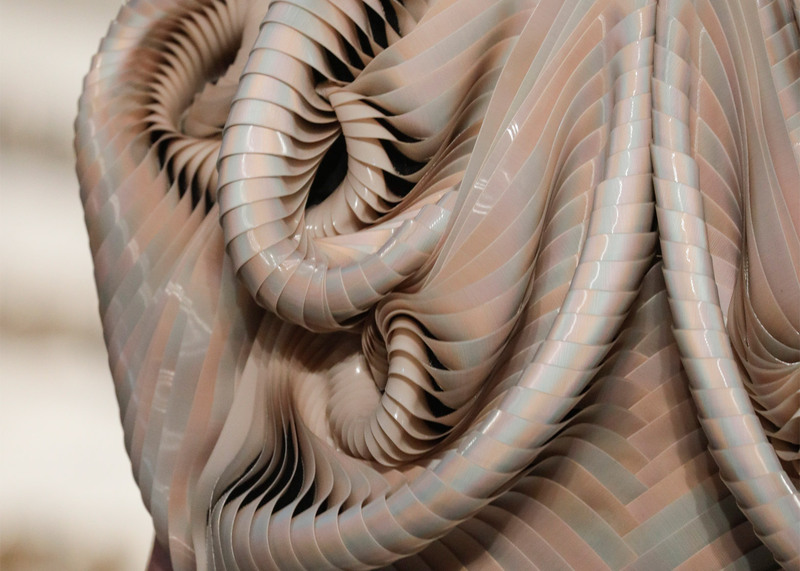 Borrowing his technique, the designer integrated thousands of droplet-shaped crystals into a long silicone dress so they appear to be dripping down the body. The use of bubble-like forms was a continuation from van Herpern's latest ready-to-wear collection, presented in March 2016. Other garments in the collection were based on the shapes found in cymatics – a vibrational phenomena caused by sound waves that can be seen across fluid surfaces. "In cymatics, the higher the frequency of the sound wave, the more complex the visible patterns," said van Herpen's show notes. "The collection reflects circular shapes and geometric patterns that are common in cymatics, which serve as the base for the collection's biomorphic forms." 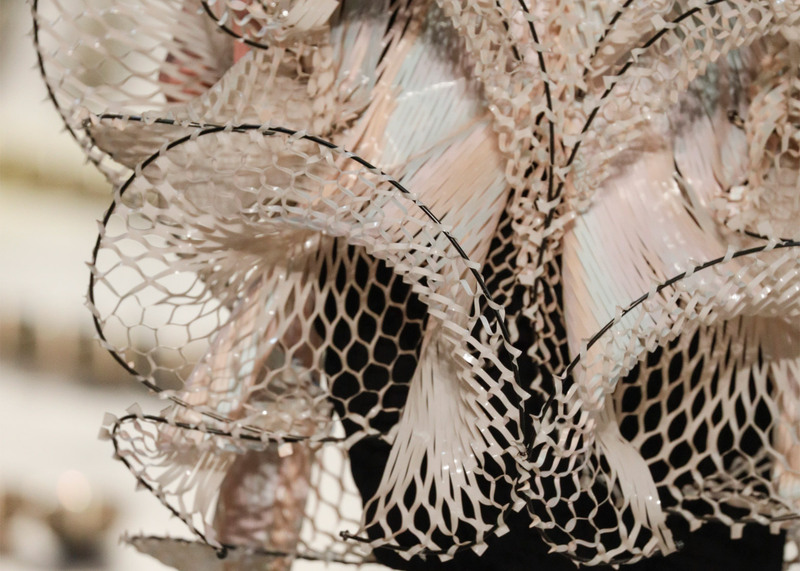 To replicate these features, van Herpen stitched pearl-coated rubber fabric onto black tulle, creating layers that looked like fossil shapes. 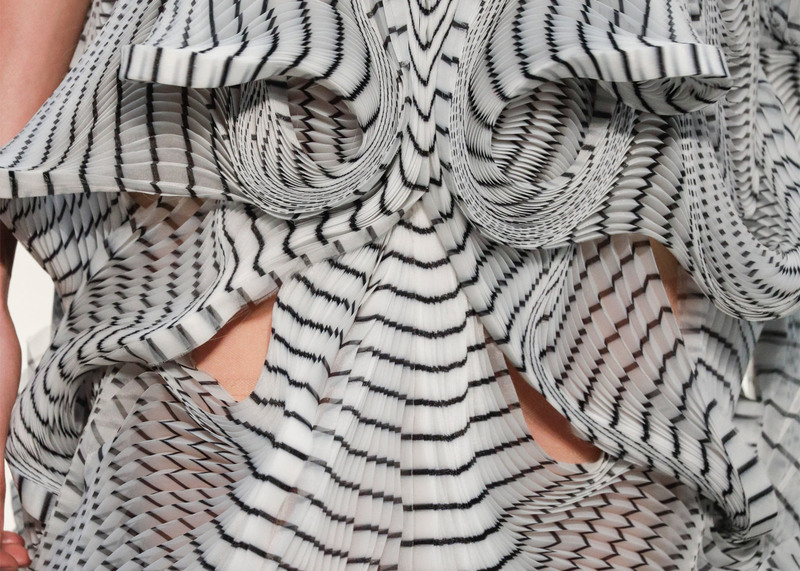 Striped patterns on hand-pleated transparent organza were designed to produce a moiré effect. The organza was woven from silk threads five times thinner than human hair, and patterned using a Japanese resist-dying technique known as Shibori to create the circular cymatic patterns. 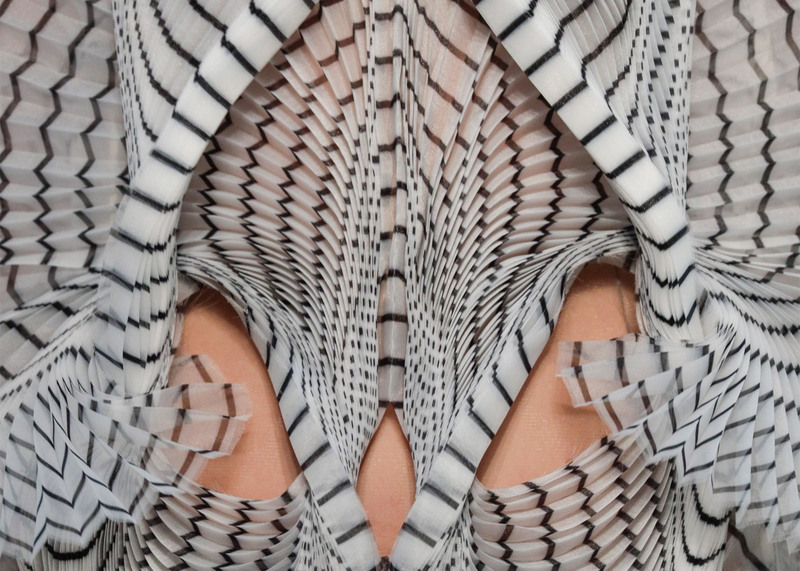 A laser-cut halter-neck dress was stretched over black wire to also look like waves produced by sound. The show took place on 4 July 2016 during Paris haute couture fashion week, and involved a live performance from Japanese musician Kazuya Nagaya. Nagaya formed a circular installation using rings of metal singing bowls, which make sounds through cymatic vibrations when their copper handles are rubbed, causing the copper bottom elements to vibrate. He used the bowls to make meditative sounds, while models walked through a central gap in the arrangement. The venue, close to the Musée du Louvre, was chosen specifically for its acoustics. 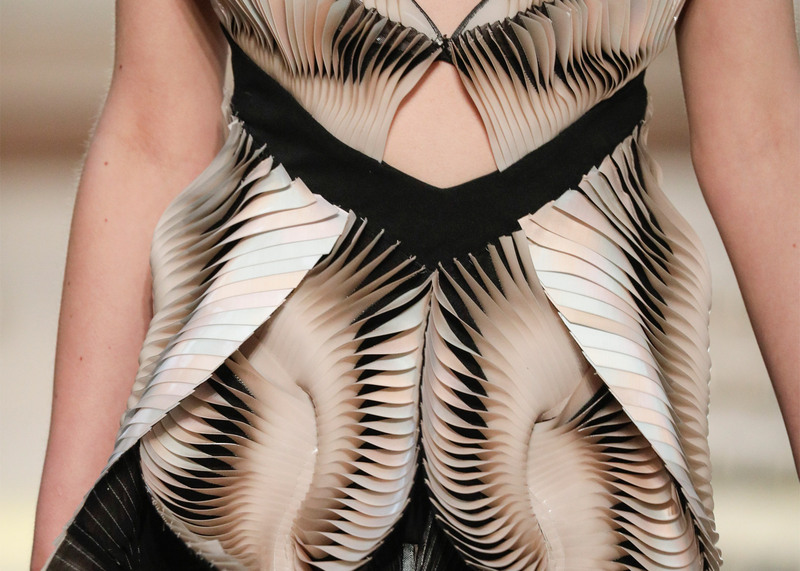 Van Herpen studied fashion design at ArtEZ Institute of the Arts Arnhem, and interned at Alexander McQueen in London before starting her own label in 2007. Her previous shows have included the use of robots to 3D-print and weave a dress over a Game of Thrones actress and suspended models in vacuums between plastic sheeting.